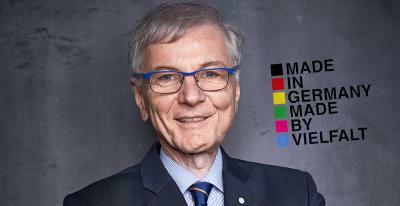 Stefan Breuer has received the 2012 Adolf Messer Prize for his fundamental research on nanostructure-based semiconductor laser sources and their applications. Working in the Semiconductor Optics Research Group led by Professor Dr. Wolfgang Elsässer, the 35-year-old physicist is investigating the properties of some of the latest semiconductor laser structures based on submicroscopic quantum dots. These offer the unique opportunity of allowing selective control of the properties of the generated laser light. It is, for example, only with quantum dot lasers that it has become possible to excite two laser states simultaneously in a single laser. Breuer makes use of this special two-state laser emission and the associated interactions that occur within the laser to generate novel emission states. In contrast to conventionally generated laser light, these exhibit properties that demonstrate especially promising potential for the investigation of the motion dynamics of both microscopic and macroscopic objects. 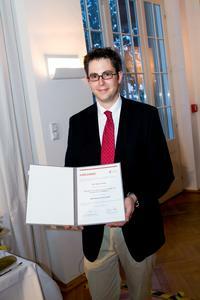 In particular, the jury gave praise to Breuer's “clear visions and plans for the understanding, physics and applications of novel quantum dot semiconductor lasers”, for which Breuer has already successfully won EU projects, released publications and received various awards, including amongst others the Gerhard Herzburg Research Prize from the Technical University of Darmstadt in 2010. Breuer, who received his doctorate in 2010 at the Department of Physics, wants to use the prize money that is earmarked for research work to open up new areas of application for made-to-measure laser emission states and to conduct further fundamental research towards deepening our understanding of the underlying physical principles. The Messer company was founded by Adolf Messer in 1898 at Höchst am Main; the company was, at that time, engaged in the production of acetylene generators. Adolf Messer's interest in acetylene lighting had been piqued as a result of lectures in Darmstadt. As a student, he had developed safety devices for acetylene generators, for which he received his first patents in 1902 and 1903. 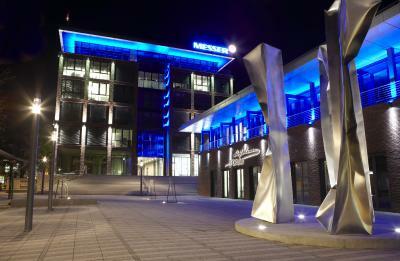 Nowadays, the Messer Group is the world's largest family business in the field of industrial gases and is headed in its third generation by Stefan Messer. Messer is the largest privately run industrial gases specialist and is active in over 30 countries in Europe and Asia, as well as Peru, with over 60 operating companies. 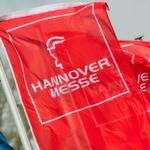 Its international activities are managed from Frankfurt am Main, whilst management of core technical functions - logistics, engineering, production and application engineering - is undertaken from Krefeld. In 2012, 5,200 exmployees generated consolidated sales of € 1,088 billion. From acetylene to xenon, the Messer Group has one of the most diverse product portfolios on the market - it produces industrial gases such as oxygen, nitrogen, argon, carbon dioxide, hydrogen, helium, shielding gases for welding, specialty gases, medical gases and many different gas mixtures.